I live in Springfield, Missouri Zone 6 It is in the Southwest part of the state, about an hour north of Arkansas and an hour east of Kansas. I have an Acer griseum x nikoense in my front yard north side, although it gets very little summer shade. It does get autumn morning and evening shade. It is a relatively young tree about 15 feet tall with a trunk caliper of about 1 1/2 inches. I am not getting the red fall colors that I am supposed to. I usually get a brown like that of many oak species. I have had it two seasons now. This year I did get some color. But, not much. It started out somewhat yellow with a brown verigation. Yellow on the inside. Brown on the margins. As I inspected the leaflets closer, I could see tints of red in most of the leafs. I wanted to know what my problem is. I believe it comes from the soil being too alkaline. But, I saw several of the standard A.griseum at Utah State University a few years ago. Their soils up there reach into the pHs of the 8s. 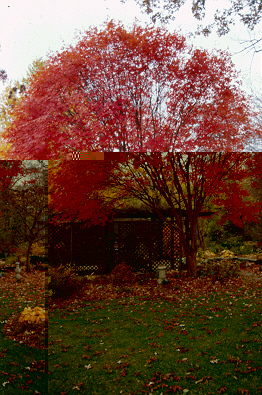 And, the fall color was a brilliant red. Do you have any ideas Thank you. Looking to get this tree - the Girards Hybrid Maple, but live in Vancouver, B.C. Canada. What is the closest place in North west Washington State that would sell this tree Our closest city in Washington is Bellingham, then Seattle. The plant that most caught my eye this week was the Girard’s Hybrid Maple. As I pulled in my driveway this week it made its case for Plant of the week. 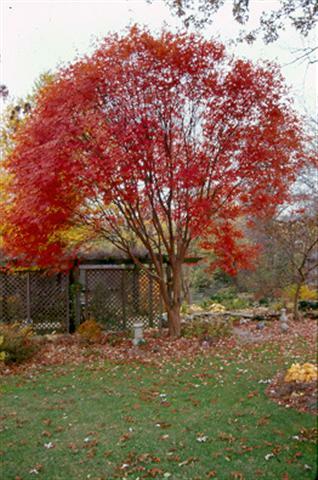 The Girard’s Hybrid Maple is a beautiful small to medium sized tree for the landscape. It is a hybrid between Acer griseum – Paperbark Maple, and Acer nikoense-Nikko Maple. Both parents are tri-foliate Maples. The bark more resembles the Paperbark Maple. This hybrid tree also goes by the names of Gingerbread™ and ‘Cinnamon Flake’. Girard’s Maple is slightly taller than wide. This tree has a nice rounded habit reaching 25-35 feet in height. 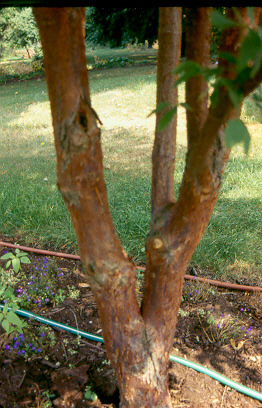 The three most notable features of this tree are the flaking Cinnamon colored bark, beautiful red fall color and its hybrid vigor. The bark is not as flaking as Paperbark Maple. It flakes in thin strips looking almost like a cat has scratched the bark. Fall color occurs late in the season about the same time as Ginkgo biloba. In fall the leaves turn a deep red with a slight edge of yellow on the very edges of the leaves. This is one of my favorite trees for fall color. When the sun hits the tree in fall it looks like it is glowing. Many trees have beautiful attributes that we can get excited about. What makes this tree so exciting is that it is surprisingly tougher than you would think. Compared to a Paperbark maple the Girard’s Hybrid will grow at least twice as fast! It is also more cold hardy than the Paperbark Maple. It grows well in full sun as well as partial shade. It transplants well and can be sold balled and burlapped or as a container grown plant. This tree is very easy to fit into designs. It is fine textured enough to go close to the house yet strong enough to be used at a distance. It makes the perfect tree to use near driveways, patios, near decks and walkways. I always like to apply the 50 rule. How many plants out of 50 would live after 5 years. This tree would receive high marks! Where did this tree originate? I am not sure I have all the information but I have been able to piece together what I think is very interesting history of the plant. I have always known it as the Girard’s Hybrid Maple. Peter Girard of Girard Nursery had some available in 1972. I suspect he was getting seed from Paperbark Maple at Highland Park in Rochester New York. The original seed or plant must have come from Highland Park. The original Highland Park plant came from a chance seedling out of a batch of Paperbark Maple seeds. Robert A. Fenicchia found the seedlings from a batch that were sown in 1951. Three trees from these seedlings were planted in Highland Park in Rochester, New York. I had the pleasure of seeing two of these specimens this year. Photos of the trees are on www.plantplaces.com. Robert Fenicchia attended the original meeting of propagators, and nurseryman in Cleveland, Ohio in 1952. He was very involved with the International Plant Propagators Society. He gave a paper to the society in 1957 about unique plants growing in the Rochester Park system which includes Highland Park. That is where both Acer griseum and Acer nikoense were planted. As far as I can tell this is where all of the hybrids that are on the market originated. I would say if it weren’t for the keen eye of plantsman Richard Fenicchia and the great collection and record keeping of Highland Park, we would not have this tree in our landscapes. Other named hybrids of griseum and nikoense are Gingerbread™ and ‘Cinnamon Flake’. Gingerbread™ (‘Ginzam’) is from Lake County Nursery. Gingerbread™ probably came from one of the plants Pete Girard started. The other, ‘Cinnamon Flake’, was selected by Dr. Sid Waxman at the University of Connecticut. It also originated as a chance seedling from a batch of seed from Highland Park. There is a plant in Fort Wright Kentucky that was purchased as a seedling of Acer griseum from the Girard Nursery in 1972. It is clearly the hybrid from Highland Park. This is one of the oldest specimens in the greater Cincinnati Region. This plant is also on the website www.plantplaces.com.